When it comes to public procurement and innovation, a lot of questions do arise. In order to tackle them, more than 150 experts got together in Brussels during two days, taking part at the Conference "Promoting Innovation Through Public Procurement: Best Practice and Networking" organized by the Directorate General for Industry and Entrepreneurship of the European Commission on March 23rd and 24th. On the introduction of the session Deputy Director General DG Enterprise & Industry, Madame Françoise Le Bail, already addressed some the main challenges faced by the European Union in promoting innovation through public procurement in order to ensure better public services, supporting innovation for companies and levering public purchasing. The European Commission has set the target to dedicate 1% of the total amount of commercial opportunities channelled through public tendering in the EU to public procurement of innovation, which represents around 20B€ per year. This target might seem "modest" when compared with US target of around 15% or the even higher target of 40% set by China but everybody agreed this is an important step and a good beginning in the path to be taken. Issues such as public contracting authorities' aversion to risk when facing procurement of innovation, their responsibility in those processes when something goes wrong, legal issues, fragmentation of demand or issues related to IP rights on procurement of innovation were some of the interesting ideas which came up at the Conference. Pre-commercial Procurement was one of the main issues of the Conference, as a way to stimulate public tendering of innovation, together with Green Public Procurement, e-Procurement, social considerations, variants or technical dialogue in public procurement. In relation to PCP, Lieve Bos from DG INFSO made an overview of the support mechanism for PCP put forward by the Commission, with some projects which are currently in place such as P3ITS, PreCo financed under Call 4 of the ICT FP7 Work Programme for 2009, RAPIDE or MKW, as well as the future launch of 2010 Calls for further EC support for PCP networks and cross-border pilots. The Conference was also the occasion for networking between the delegates, who had the opportunity to share best practices on public procurement and present their projects. Apart from PCP, some other networks and projects were present at the Conference such as euroPROC, SCI-Network, LCB Healthcare Network, ENPROTEX, APOLLON, Buy Smart, PRO-EE, Save Energy, Smart SPP, or the Project "Urbain-Loi" street from the DG OIB. One of the things which was particularly interesting for Euroalert.net was the possibility to have a first hand point of view about what are the main issues and concerns companies, and specially SMEs, face when trying to access public procurement market, either locally or at EU level. Representatives from different Enterprise Europe Network partners described to the delegates an overview of such issues, depicting a pan-European view coming from partners from a very varied origins representing their EEN branches such as ACC1O Competitivitat per l'empresa, the Grenoble Chamber of Commerce and Industry, Bayern Innovativ, Chamber of Commerce of Finland, ABZ Bayern, City of Bradford, Promofirenze, EISC Southampton, Cardiff University or Berlin Partner. As you can see, there were a lot of interesting networks and projects represented, and hope we haven't missed any of them..., but if it is the case, just let us know! One of the main concerns, specially when talking about SMEs and their access to public procurement, was related to below EU thresholds tendering, where we got to know more about some very interesting initiatives such as PIANOo, ETIS or ALPPS. As some of you already know, one of Euroalert challenges now is offering to all our clients, partners and subscribers the high quality information and tools already available for EU procurement, also for below EU thresholds tendering. Any tip or help in identifying public sources of tenders and PSI contents susceptible to be re-used will be very welcomed, as Euroalert.net is highly involved in initiatives related to Open Data and the re-use of PSI specifically in the field of public procurement. 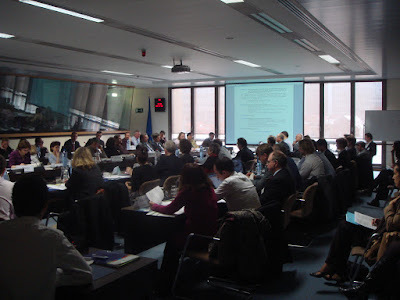 It has been a very valuable forum for Euroalert.net as we have been able to know more about the needs of agencies, organisations and companies in their access to public procurement. As you all know Euroalert offers an innovative and cost-effective gateway to European public procurement by publishing all the calls for tenders, awards and other announcements published by the OJEU and the possibility to publish any Euroalert.net content in any other website. But Euroalert.net and its sister brand 10ders Observatory has also developed a full set of tools which allow companies and specially SMEs to get access to cost-effective high quality market-intelligence reports about public procurement to improve their performance in this highly competitive market. This kind of fora will help us in knowing better about the needs and keeping on developing always more powerful Euroalert.net tools on public procurement information. Thanks again to DG Industry & Entrepreneurship and specially to all the people in the organization of the Conference for giving us this opportunity to take part in this successful event! 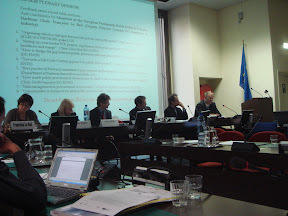 As a souvenir of the Conference, here are a few pics of the event. Lot of work in two days! Good luck in their projects to all participants and hope to see you all in a future occasion! Note: updated April 21st. Presentations already available at EC Enterprise website. Khoảng độ tuổi nên bổ sung collagen vậy nhỉ, điều này không giới hạn tuổi nhưng 25 tuổi thì có thể dùng tốt nhất. Vậy cách bổ sung collagen hiệu quả để dó một làn da trắng khỏe đẹp, vậy ta nên bổ sung collagen bằng thực phẩm đơn giản là điều đúng nhất, thế collagen có trong thực phẩm nào nhiều nhất là những thực phẩm nảo, ngoài sử dụng thực phẩm bổ sung collagen ta bổ sung collagen bằng thuốc uống không bổ sung collagen bằng các thực phẩm tự nhiên là những loại thực phẩm nào, có dễ kiếm không, ngoài trái cây ra chúng ta có thể kiêm bổ sung collagen bằng cách nào tốt nhất không vậy. Nhật bản có một loại collagen đó là collagen dạng nước của shiseido giúp chị em có làn da trắng và khỏe, Sữa ong chúa là gì? sữa ong chúa royal jelly careline 365 viên úc giúp bồ bổ cơ thể, bổ sung năng lượng cho ngày làm việc mệt mỏi. We will focus on the new services that euroalert.net has to offer; the new services which we are setting in motion and also the improvements to those which you already know and use. We ask you to participate with us to fulfill the greatest possible potential for euroalert.net's community. Except where the opposite is specifically mentioned, the contents of this blog are published under the licence Creative Commons Attribution - Non-Commercial - No Derivative Works 2.5 Spain. If you are not familiar with this license, see details of the licence before using the contents. If you have any doubts please contact us. This blog is published with Creative Commons Attribution-Non-Commercial-No Derivative Works 2.5 Spain license.